The company we now know as Mazda dates back to the January 1920 formation of Toyo Cork Kogyo Co. Ltd. (roughly, “Oriental Cork Industrial Company”) in the Japanese city of Hiroshima. The company’s initial business, the manufacture of synthetic cork products, soon fell on hard times and in early 1921, its creditors appointed a new president, 45-year-old Jujiro Matsuda, a fisherman’s son and one-time blacksmith’s apprentice who had previously founded his own firearms company, Matsuda Works. Matsuda took Toyo Cork Kogyo in new directions, including the manufacture of machine tools and a brief stab at building motorcycles. By 1927, the cork business had been abandoned and the company’s name became simply Toyo Kogyo Co. Ltd. In 1931, Toyo Kogyo introduced its first successful motor vehicle: the Mazda-GO DA Type truck, a three-wheeled, cargo-carrying motorcycle powered by a 500 cc (30 cu. in.) engine. The “Mazda” trade name, also used by General Electric for a brand of light bulbs, was selected primarily as an alternative transliteration of “Matsuda,” but it also meant “wisdom” in the ancient Avestan language of the Zoroastrian religion, most commonly associated with the supreme Zoroastrian deity, Ahura Mazda (Lord of Wisdom). 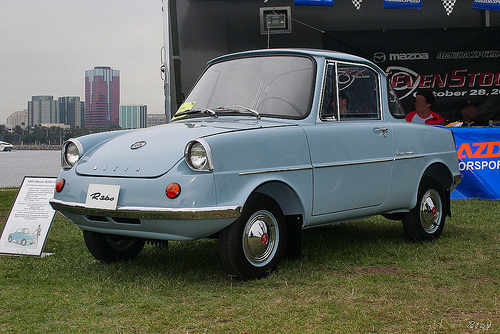 Initially distributed by Mitsubishi, the little Mazda three-wheeler sold well both before and after World War II, spawning several follow-on models and eventually the company’s first four-wheeled truck, launched in 1950. While Jujiro Matsuda had contemplated building automobiles around 1940, the war and subsequent reconstruction tabled those plans and Toyo Kogyo did not offer its first passenger vehicle until 1960. Like many early Japanese automobiles, the initial Mazda R360 Coupe was a tiny kei car powered by an air-cooled V-twin engine, not vastly different from the motorcycle-engined European “bubble cars” of the time. Nonetheless, the R360 and the subsequent four-seat Mazda Carol, introduced in 1962, were quite successful in the growing Japanese market, briefly making Mazda Japan’s best-selling automotive marque. Despite that success, Toyo Kogyo faced a more serious, long-term threat to its existence. While the Japanese economy was expanding rapidly, the domestic auto industry was still quite small and very vulnerable. With considerable diplomatic pressure to relax import restrictions, Japan’s Ministry of International Trade and Industry (MITI) was contemplating drastic measures to protect native industry from a potential flood of foreign-made cars. One rumored possibility was a consolidation of domestic automakers into as few as three or four major conglomerates, an alarming prospect to smaller companies like Toyo Kogyo, which under such a plan would either disappear or be absorbed into larger automakers like Nissan or Toyota. Jujiro Matsuda’s son Tsuneji, who had succeeded his father as president in 1951, decided that the only way for Toyo Kogyo to survive as an independent company was to offer products or technology that rivals could not match. Cars like the R360 and Carol were competent efforts, but they were fairly conventional. For the company to have a future, Mazda needed something unique. Matsuda found his answer two continents away, at NSU-Motorenwerke in Neckarsulm, Germany, which had recently announced a novel new rotary engine co-developed by NSU and independent engineer Felix Heinrich Wankel. Although Felix Wankel’s name is still closely linked with the rotary engine, it was not a new idea even when Wankel first started working on it in the 1920s. Plans and patents for rotary steam engines had been developed as far back as 1769, although it’s unclear if they were ever built or would have worked if they had been built. Wankel’s own interest in rotary internal combustion engines had begun when he was only 17 years old, stemming from a dream he once had about a car powered by an engine combining the best attributes of piston engines and turbines. He patented his first rotary engine in 1934 while pursuing a related idea, rotary valves for piston engines. Wankel was subsequently commissioned by the German air ministry to apply the latter concept to aircraft engines, work that led to his arrest and a brief imprisonment after the war. He was released in 1946 and eventually resumed his work at a new research lab in the Bavarian city of Lindau. In 1951, Wankel signed a consulting agreement with NSU to develop rotary valves for motorcycle engines, later followed by a rotary supercharger. (NSU had made automobiles before the war, but sold its auto business to Fiat in 1929 and did not return to passenger car production until 1957.) However, Wankel remained eager to develop a true rotary engine and lobbied strenuously for NSU to underwrite the project. At first, the NSU board was not overly enthusiastic, but by 1954 Wankel had persuaded company management to share the development costs and any patents related to the new engine. The engine that we now think of as the Wankel rotary was actually a substantial departure from Wankel’s initial early-fifties concept, the Drehkohlbenmotor (DKM, rotary-piston engine). Developed mostly in Lindau by Wankel and his research partner, Ernest Höppner, the DKM featured a trochoidal (triangular) inner rotor with a spark plug set into one face. Both the inner rotor and the rotor housing (sometimes described as an outer rotor) spun around a common stationary center shaft with the combustion process taking place between the two rotating bodies. 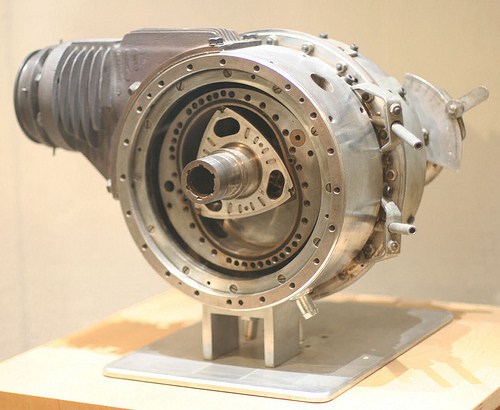 DKM prototypes, which first ran in 1957, had excellent volumetric efficiency — particularly considering that the intake charge had to be routed through the center shaft and inner rotor — and could sustain very high speeds with almost no vibration. From a practical standpoint, however, the DKM left much to be desired. Low-speed performance was poor and high rotational inertia made the engine reluctant to change speeds, problematic for anything other than stationary applications. Furthermore, the transmission or output shaft had to be geared to the outer rotor/rotor housing, which was inconvenient from a packaging standpoint. Changing spark plugs required tearing down the entire engine. 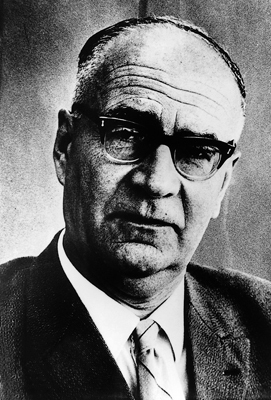 Recognizing those problems, NSU research chief Walter Fröde pushed for an alternative design, the Kreiskolbenmotor (KKM, circuit piston engine), which first ran in mid-1958. In Fröde’s KKM design, a trochoidal inner rotor drove the output shaft via cycloidal gears, causing the rotor to trace an epitrochoidal path (a shape often compared to a peanut or a cocoon) along the inner surface of the rotor housing (see the sidebar on the next page), which unlike in the DKM remained stationary. This approach sacrificed some of the DKM’s smoothness and rev potential as well as posing certain challenges for cooling, but offered much better low-speed behavior and was vastly easier to install and maintain. Wankel was unhappy with the KKM, considering it a cheapening of his concept, but the practical advantages were hard to ignore. The NSU board made it clear that the cash-strapped company could not afford two different rotary designs, so Fröde eventually persuaded Wankel to abandon the DKM. Even so, the rotary project was a big gamble for NSU and the Neckarsulm firm lacked the resources to fully develop or exploit the new engine on its own. With prototypes running on test stands, NSU started looking for partners and licensees to share the work and the cost. The first was the American aviation company Curtiss-Wright, which in October 1958 paid a reported $2.1 million (plus a 5% per-engine royalty) for exclusive, sublicensable U.S. rights. Over the next few years, NSU would receive more than 100 other license requests covering everything from lawnmower engines to heavy-duty diesel applications. When Tsuneji Matsuda heard about the rotary engine in late 1959, he concluded that it was exactly what Toyo Kogyo needed. 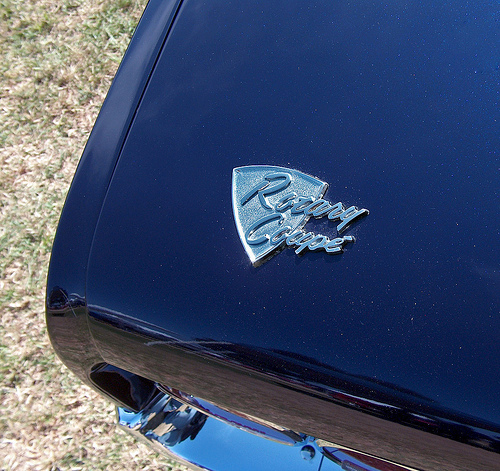 The rotary was mechanically elegant, had great potential, and was radically different from anything else on the road. Matsuda made initial overtures in early 1960 and visited Neckarsulm with a group of engineers that October to see NSU’s development engines and negotiate the licensing agreement. MITI approved the deal in mid-1961. The reported license fee was ¥280 million (about $780,000 at the contemporary exchange rate). The agreement gave Toyo Kogyo the right to use and sell the rotary engine in Japan and Asia. All they had to do now was make it work. Great story looking forward to part 2. A friend in Tasmania had several of those bertone Luces nice cars the later models had the 1800 Capella engine. Thanks for the Mazda rotary article. I’m looking forward to reading Part 2. Despite growing up around Mazda rotary-powered cars, I learned quite a bit! It’s a real shame that no one can seem to lick the engine’s fuel and oil consumption problems. I have heard some discussion of Mazda using rotaries in hybrids, which makes some sense to me. Rotaries are so small and, on paper at least, elegantly designed. Man, that Luce coupe is a looker. I don’t know about hybrids, but Mazda has done quite a bit of development on a hydrogen-fueled rotary, which has been offered on a limited basis for fleet sales in some markets. If the next-generation 16X engine materializes, Mazda is hoping to reduce fuel consumption substantially, in part by adopting direct injection. Still, since piston engines keep improving in that regard, as well, I don’t know that the rotary will ever match the reciprocating engine in specific fuel consumption. Some things can be mitigated (like wall quench), but other factors, like the combustion chamber surface area to volume ratio, are sort of the nature of the beast. The Luce R130 is indeed a very nice-looking car. I’d never seen one before I started researching this story. Very interesting article, well, as usual, Aaron! The topic was somewhat forgotten in France after Citroën heavily invested in the technology, eventually failed to make it work and had to drop the project in the early 70’s. They had been so serious about it that the models developed in the late 60’s, the GS and the XM, were designed for a rotary. They had to hastily develop a reciprocating engine for the GS and make it fit in the engine bay that was not large enough. The XM eventually was painfully fitted with a Peugeot engine. Anyway Citroën was never able to design a good engine. This huge investment and its failure played an important role in the demise of the company. You mean the SM, don’t you? I believe Nicolas was probably referring to the CX, which replaced the Citroën DS in 1974. I’ve never heard anything about the SM being intended for rotary power — of course the production cars had the Maserati V6 — but I think the CX was. The XM was the CX’s eventual successor, introduced in the late eighties. Right Aaron, my pen slipped, it was the CX. The XM was its successor. The SM, stangely enough, was fitted with the (in)famous Maserati V6 even though Citroën had such a faith in the future of the rotary as the ultimate replacement of the reciprocating. Timing may have had something to do with it. Citroën didn’t build the first M35 single-rotor cars until the fall of 1969, and as I understand it, they were essentially evaluation models, not yet intended for large-scale production. The BiRotor wasn’t introduced until 1974, about four years after the SM debuted. Even if Citroën were keen to give the SM rotary power, it probably wouldn’t have been ready until a few years after launch, even in a best-case scenario. If things had worked out differently, I imagine Citroën might have added a rotary engine to the SM later, perhaps in a second-generation version for the mid-seventies. Of course, even if the Comotor engines had been more successful, the SM was not, and might have been dropped without ever getting a rotary engine. For them the rotary was the future type of engine for all applications, just as well as they were persuaded they had a market for the SM. With NSU, Mazda and others working on it it’s understandable. Your article is very interesting by showing how Mazda made a success of it, or at least could partly make a living with it, well… that’s a success, isn’t it? Strangely enough it didn’t catch on as an aviation engine either. Starting in 69 a limited number M35, and in 73 GS Birotor, were sold to selected, faithful (and masochist) clients but the engine proved such a burden to maintain that Citroën offered to buy them back and scraped them. A few people only turned down the offer. The maintenance contracts were canceled for them. The few models still in existence are now very expensive collectors’ items, the day dream of all the GS enthusiasts. So there was actually a future for the rotary! ;-) As usual the car that nobody wanted became the car that nobody can afford. The source I was looking at (John Hege’s [i]The Wankel Rotary Engine: A History[/i]) suggests that Citroën had basically intended to buy back the early evaluation engines from the outset, which would make a lot of sense. I don’t know about France, but in the U.S., automakers are legally obligated to provide parts support for production models for a specific period of time, typically 15 years — obviously not an appealing prospect for cars or engines that don’t end up in mass production! For that and other reasons, some automakers have tended to offer such evaluation vehicles only as a closed-end lease or other type of loan-out, with no option to actually purchase and keep the vehicle at the end; I assume that not actually selling it avoids triggering certain legal requirements. The Europeans have basically the same obligations as the Americans. As far as I understood, the deal was under specific conditions and since Citroën offered to buy them back it could cancel any support for those who rejecter the offer. It’s stupid it didn’t keep one example for history. Mazda is the only one who succeeded with a rotary over the years while all the others flopped. This is an interesting article as usual, I’m waiting for the second part. While you’re at it, how about an article covering GM’s attempt to build a rotary engine? I thought about it, but in researching this article, I’m finding that detailed information about its development seems to be surprisingly scarce. While the development of the NSU, Mazda, and Curtiss-Wright engines is pretty well-documented, GM played it very close to the vest. To really do it justice would probably require talking to some of the engineers who worked on it, assuming that the people involved are still living, and willing (and able) to talk about the program. ffffttttt exhaust “note” of them at all. Used to be a few about Brisbane, Delighted to see and hear that rust and enlightenment of the owners has made them almost extinct. Good riddence. So it could rev to 5 digits. Wow, FANTASTIC article! Thanks for the great piece on Mazda, the detail and depths you go to are above and beyond. One of the best history-of-automaker stories that I’ve read. Thanks again! Another great article Aaron. Really appreciating your narrative drive and level of scholarship. I’m starting to believe the R100/1200 body was designed by Bertone as well, but can’t verify. Do you know of any text that addresses the connections between the Italian design houses and the Japanese manufacturers in depth? I so far haven’t found anything to suggest one way or another whether the first-generation Familia was done by Bertone, although it’s certainly plausible given that Bertone did the first Luce and the Luce Rotary Coupé in that period. Even if Stilo Bertone didn’t do the Familia or the first Capella, those designs have a definite Italian flavor, much more so than subsequent products of Toyo Kogyo’s in-house design studio, which feel more typically mid-seventies Japanese.